Synleor has updated its harmonic composition tool Harmony Improvisator. MusicDevelopments announced an update of RapidComposer and RapidComposer LE, their music prototyping application. 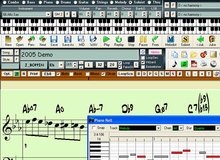 MusicDevelopments released an update of RapidComposer, a phrase-based music prototyping software for composers, song-writers and musicians. Sonic Charge have created an online tool that they call The MicroTonic Patternarium, described as"an online collaborative patch randomizer."